The Crook County Cowboys started the golf season off with a bang, placing second at the Redmond Invitational, which was held Monday at Juniper Golf Course. "Straight out of the gate with not a whole lot of practice under our belt, we shot 360 as a team and got second place behind Bend," Crook County head coach Zach Lampert said following the tournament. "I'm not sure, but I don't think that we shot anything that low all of last year, so it was definitely a good way to start." Even more satisfying than the low score was how well the Cowboys did against the Intermountain Conference teams that were at the tournament. After moving up from Class 4A to Class 5A, the Cowboys had questions about how well they could compete. Those questions seemed to be answered as every IMC team except Pendleton competed in the tournament. "Pendleton wasn't there, but the rest of the league was, so we are happy that we were able to beat all of them," Lampert said. "All the league teams were within about 15 shots, so it's going to be a tight league. It looks like it's going to be real competitive." Bend easily won the tournament, shooting a team score of 342. Crook County finished second with their score of 360. They were followed closely by Hood River Valley and Ridgeview, which tied for third with scores of 364. The Dalles was fifth with a score of 374, while Redmond trailed the field with a score of 389. Tyler Vassar of The Dalles took medalist honors with a two-under par round of 70. Ridgeview's Isaac Buerger finished second with a one-over par score of 73, while Bend's Parker Krovisky was next with a round of 77. Crook County was led by Brodie Kuizenga with a score of 82. "That's a good score for him," Lampert said. "It's one of his best rounds ever." Next in for the Cowboys was Hogan Smith with a round of 88. Trenton Brinkley and Cayden Lowenbach rounded out the scoring for Crook County with rounds of 94 and 96, respectively. The fifth Cowboy golfer was Addison Peer, who finished with a score of 106. "They, like always, left a few out there," Lampert said. Although the Cowboys finished ahead of all the league teams that were in attendance, Lampert noted that Ridgeview was missing one of their normal varsity golfers. "Ridgeview was missing their No. 4 player, who could probably be a pretty big swing of strokes," he said. "Their top two guys played really well, but the rest of the league, I think that they pretty much had everybody." 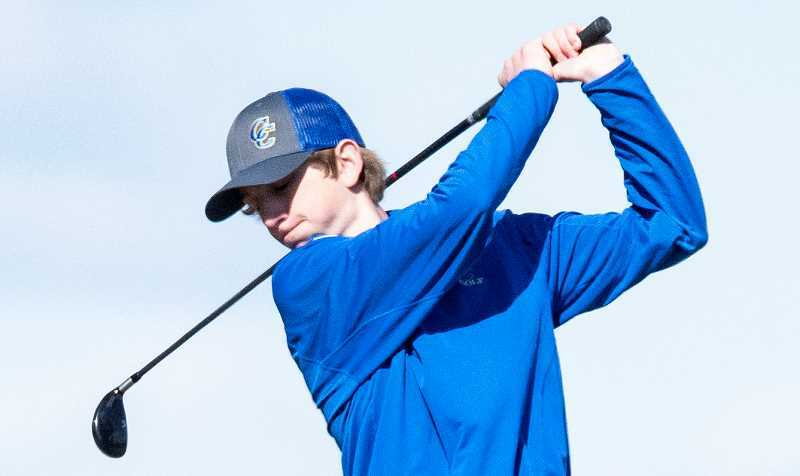 Lampert added that the Crook County High School JV team played nine holes at Juniper Golf Course on the same day from the same tee, and two of those golfers have put themselves into the mix for a possible varsity spot. Tannon Joyner and Carlos Sanchez each shot rounds of 51 for nine holes. The Cowboys are back in action on Friday when they host a tournament at Meadow Lakes Golf Course. Action is scheduled to tee off at noon. Following Friday's golf, the Cowboys will travel to Hood River on Monday for the first of four Intermountain Conference matches. The team that wins the league title based on those four matches will automatically qualify for the state tournament, while the teams that finish in second through fourth will have to go to a regional tournament and attempt to qualify. "We will probably get to play all seven of them on Friday at Meadow Lakes, so that will be the qualifier for that first league match," Lampert said. "It was a good start to the season, and I think that they were encouraged to see that they were the lowest of the 5A schools. That was fun for them. It is going to be a real competitive league, but they are right in the middle of it. It should make for a fun year." Team scores —1. Bend, 342. 2. Crook County, 360. 3. Ridgeview, 364. 3. Hood River Valley, 364. 5. The Dalles, 374. 6. Redmond, 389. Medalist — Tyler Vassar, The Dalles, 70. Top 10 — 1. Tyler Vassar, The Dalles, 70. 2. Isaac Buerger, Ridgeview, 73. 3. Parker Krovisky, Bend, 77. 4. Justin McMahon, Ridgeview, 78. 5. Brodie Kuizenga, Crook County, 82. 6. Cort Benner, Bend, 83. 7. Aidan Telles, The Dalles, 87. 8. Chad Klaas, Hood River Valley, 88. 8. Hogan Smith, Crook County, 88. 10. Don Cort, Redmond, 90. Crook County (360)— Brodie Kuizenga, 82. Hogan Smith, 88. Trenton Brinkley, 94. Cayden Lowenbach, 96. Addiston Peer, 16.